Summer is just around the corner and we all just love to hit the beach as soon as possible right??? lovely colours, breeze, beach sand, and calmness. Enjoying the awesome beaches are always fun and we wait for this the whole year. So, why not make the beach outings more creative and colourful. We have some lovely Free Crochet Patterns listed just for you. Today we will share patterns for Beach Cover up Skirt. 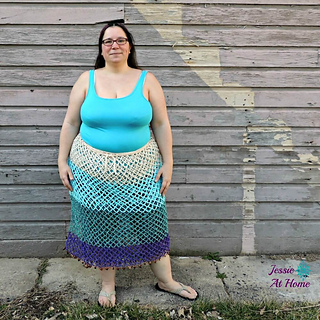 Not your granny’s Skirt by Brandi Isham is a lovely Granny Design beach skirt made using Sport weight yarn and a 4.00mm crochet hook. The pattern is available as a Free Ravelry Download. Lovely Lily Cover-up/Wrap by Lisa Jelle is a cute one made using Sport weight yarn and a 4.00mm crochet hook. We loved this pattern and the colour too. Water’s Edge Cover-up by Emily Nelson is a beautiful skirt made using Worsted weight yarn and a 5.00mm crochet hook. Miami Beach Skirt by Erika and Monika Simmons is an awesome colourful skirt made using Aran weight yarn and a 6.5mm crochet hook. Th pattern is available for all sizes. 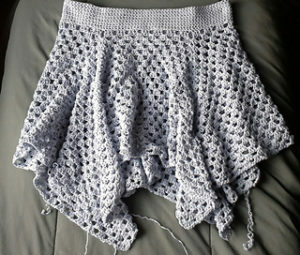 Skirt / Rock by Lana Grossa made using Worsted weight yarn and a 3.5mm crochet hook. It is a beautiful pattern and would look amazing on anyone. Beach Flowers by Brenda Grobler is a lovely pattern made using Sport weight yarn and a 3.75mm crochet hook. It is a beautiful pattern indeed and a must try. Nettie’s Super Simple Cover Up by Jessie Rayot is a lovely pattern made using Worsted weight yarn and a 4.00mm crochet hook. Caribbean Skirt by Erika and Monika Simmons is a pretty long skirt made using Worsted weight yarn and a 6.00mm crochet hook.